In June 1996, on his visit to Berlin, Pope John Paul II, beatified Bernhard Lichtenberg as a martyr. He is commemorated each year on November 4 in the diocese of Berlin when his story is retold; the story of the time of persecution of the Jewish People in Germany and the story of one brave man of the church, risking his life trying to help them. On the July 7, 2004, Bernhard Lichtenberg, was honored as a “Righteous among the Nations by Yad Vashem. 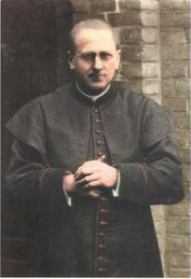 Blessed Bernard Lichtenberg was born on 3 December 1875 in Ohlau, Germany, and ordained a priest in Breslau (now Wroclaw, Poland) in 1899. A year later he began his pastoral mission in Berlin, where he worked in various parishes until being appointed parish priest in the district of Charlottenburg. In 1931 the Bishop called him to the Chapter of St Hedwig's Cathedral, where he was named parish priest the following year and provost in 1938. Very active politically in the Centre Party, he went to Goring in 1935 to protest the cruelties of the concentration camps. From 1938 he became known for his evening prayers in the cathedral (which was only a kilometre from Hitler's Reichskanzlei) for the wounded, prisoners, soldiers fallen in battle (on both sides), Jews and the persecuted. Bishop Konrad von Preysing later entrusted him with the pastoral care of baptized Jews. He said prayers in public for the Jews in November 1939 on the evening of the mass destruction of Jewish property which came to be known as Krystallnacht. After watching his every step and making numerous threats, the Gestapo finally arrested him on 22 May 1942. He was given a two-year prison sentence for treason and "misuse of his official position". Already seriously ill, the Gestapo considered his presence in the city a threat and ordered him to be transferred to Dachau, but he never arrived. Because of his extremely poor health he died in a cattle car on 5 November 1943 as the transport train passed Hof.